More than half of the country's inhabitants are aged under 25. The island is also home to rare flora and fauna, having developed its own ecosystems and wildlife since splitting from the African continent some 160 million years ago. Preserving its impressive biodiversity is an ongoing challenge for the country. With an area of almost 600 000 sq km, Madagascar is the fourth largest island in the world. Some of the world's most extensive coral reef systems, huge mangrove areas, and a vast array of birds, lemurs, and many other species can be found here. Deforestation poses a serious threat to the island's habitats, with illegal wildlife trade representing a further challenge. 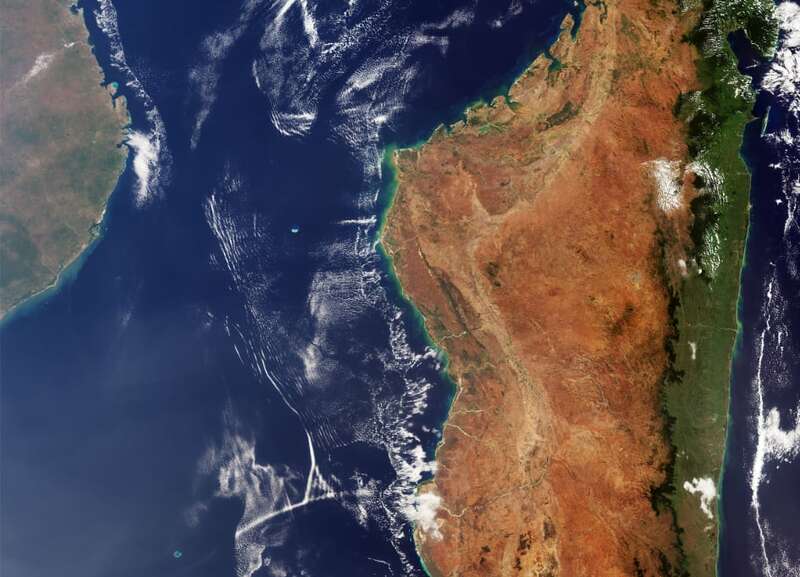 In this true-colour image from Copernicus Sentinel-3's ocean and land colour instrument, we can see sediment in the water along the coast. The island appears in green on the east coast, where the prevailing trade winds bring clouds and up to 3.5 m of rain per year to the low-lying coast. Sentinel-3 is a two-satellite mission to supply the coverage and data delivery needed for Europe's Copernicus environmental monitoring programme. It provides critical information for a range of applications from marine observation to large-area vegetation monitoring.